I'm happy to announce that our Official Wiki is entering beta. We looked into a bunch of wiki software but they were all overblown and unappealing, so we decided to make our own simple & streamlined wiki software in the codex (much easier than making an MMO, believe you me! :D ). We will be giving select wiki access out to interested players, so please comment here if you're interested in helping out. I'd love to help -- count me in! Also, YAY! An official wiki! Looks awesome so far, nice and streamlined, very fast. Hooray! Oh, I would definitely love to help! Wow! This is awesome! Are the guilds dynamic? In other words, if I change my guild name or whatever, will it automatically update in the wiki? I raised a ticket for this earlier, but... Shrooms United is a ghost guild and needs to be purged. Yep, the codex uses the same database as the game. Oooh! Very nice! I would gladly aid in the wiki's expansion if you will have me. @mactheterrible should be our third member. What do you say, mac? In other news, I would also like to help in this wiki project! Definitely in @dmmagic - sounds like fun! 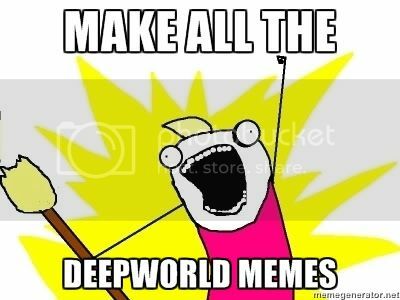 Hey, could you put some of the memes from the Deepworld meme thread? No wasted effort -- you can copy the content over! Or will the grow lamps aid in growth in other biomes? Oh heck yeah ill help! I'd love to help out with the wiki! Everything looks so clean, and very organized. I used to be a helper in the Deepworld Wiki (Wikipedia) so count me in ! I wouldn't mind helping at all. By the way, great job guys. Awesome, all of it is awesome!! I helped on the last wiki, so I'd love to be involved in this too!! Oh yeah, how do you go about registering a "Home world" for a guild? It looks amazing! If you're still giving out access, I would love to help with the wiki! I'd love to help expand it! Ill try to get some art and memes in! Whichever world your guild obelisk is placed in is referred to as your "home world". @mikelaurence you know that I'm in, I love the community and the lore. Ill be glad to add as much accurate information as I can.